What is the Federal Data Center Optimization Initiative (DCOI)? The Federal Government Data Center Optimization Initiative (DCOI) Mandate. The US government is one of the world’s biggest data center users, its departments and agencies using IT are housed in about 2,000 government-owned data centers. The government has been struggling to fix the inefficiency of this infrastructure for a long time. The Federal Data Center Consolidation Initiative (FDCCI) and the Data Center Optimization Initiative (DCOI) mandates have been designed to address these issues. What is the DCOI Mandate? As of March 2016, and as stated in the August, 2016 Memorandum for Heads of Executive Departments and Agencies (M-16-19), the Federal Data Center Consolidation Initiative (FDCCI) is superseded by the Data Center Optimization Initiative (DCOI). The DCOI requires agencies to develop and report on data center strategies to consolidate the inefficient infrastructure, optimize existing facilities, achieve cost savings, and transition to a more efficient infrastructure, such as cloud services and interagency shared services. While the previous FDCCI mandate required agencies to conduct data center inventories and report on those facilities that could be closed or consolidated, it did not prevent the building of new data centers. The DCOI takes the FDCCI one step further, identifying specific goals that must be achieved including the reduction of government data center spend by $1.36 billion over the next three years. Similar to the FDCCI mandates, agencies are required to develop and report on strategies specifically around the consolidation of inefficient infrastructure. However, now under DCOI agencies will no longer be able to build a data center specifically to support their needs. If a new data center is needed, a case showing that there is no better alternative, including cloud services, colocation facilities or shared space is required. Additionally, the DCOI also raised the amount of data centers agencies are required to close. At least 25% of tiered and at least 60% of non-tiered data centers shall be closed by the end of fiscal year 2018. 4. Server Utilization & Automated Monitoring. By the end of 2018, agencies have to replace manual collections and reporting of systems, software, and hardware inventory housed within data centers with automated Data Center Infrastructure Management software in all of their data centers. While not yet in place, the General Services Administration will oversee a centralized DCIM software procurement program that will have to be used. 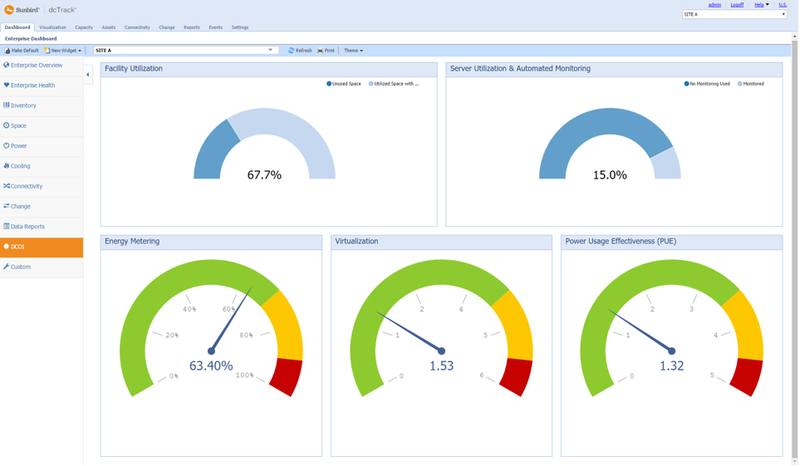 DCIM allows data managers to automatically monitor data center assets and measure energy usage, power usage, virtualization efforts, server utilization, and facility utilization. The resulting information can reduce costs while increasing energy and power efficiency and utilization, leading to better strategic decisions to comply with the regulations of DCOI. Using DCIM in combination with the installation of meters, Intelligent Rack PDUs, and monitoring tools provides an optimal solution to achieving the goals set forth by DCOI. Sunbird’s DCOI Executive Dashboard provides the optimal experience for ensuring your data center’s compliance with the DCOI mandate. Gain easy, one-click access to the Key Performance Indicators (KPIs) you need, and then act on your insights to meet DCOI requirements. Works without additional user configuration so you can immediately review and analyze your data. Preloaded with five widgets that track only the relevant KPIs for fast, laser-focused data analysis. Leverages real-time, accurate data that is collected and stored from the iPDUs and meters in your data center by our DCIM software. View the latest readings for a current snap shot or trend your data over time to track your progress on your DCOI objectives.